Meet Ariella Chezar of Ariella Chezar Design. I captured this lovely portrait of the floral genius on a recent March morning. 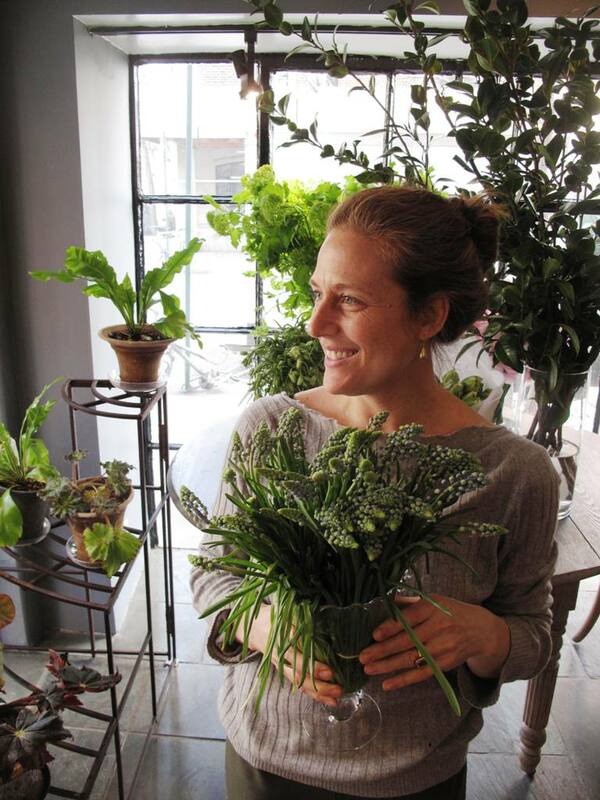 She’s standing insider Ariella Chezar New York, her new flower shop, holding a vase of her absolutely favorite grape hyacinths (Muscari). Today’s guest is a floral rock star – someone whose work has appeared in every hot style magazine around – from Martha Stewart Weddings and Modern Bride to O Magazine and Town & Country and countless others. Please meet New York & the Berkshires-based Ariella Chezar. For 20 years, this gifted daughter of nature has expressed her love of flowers, both cultivated & wild as both a floral designer and an inspiring and generous teacher. Known for her lush, whimsical, garden style, Ariella has influenced the floral industry coast-to-coast. In her early days, she worked magic in Berkeley, responding to the untamed, native beauty of the Bay Area and Northern California, Chronicle Books tapped her to create “Flowers for the Table,” a lovely, evocative book that helped propel Ariella into the world of editorial floral design. Later when she returned to the Berkshires in Massachusetts, Ariella settled into her childhood homestead where in the past decade she has produced weddings, events and editorial projects from her studio there. 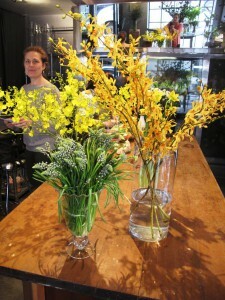 Inside her new shop, I catch a glimpse of Ariella behind the orchids. Last summer, Ariella made many people happy when she opened her first retail project – Ariella Chezar New York, a floral outpost in Tudor City, one of Manhattan’s most charming secret neighborhoods, located just a stone’s throw from the United Nations. Why is Ariella’s work so celebrated? In our podcast interview, recorded on March 11th, Ariella identifies the place (California) and the moment in time (the late 1990s and early 2000s) when she developed, almost unconsciously, her carefree, uncomplicated design aesthetic. She was mesmerized by the abundance of carefree, unconstrained vegetation around her – and in response, her design style was and has continued to be unique and iconic. Today, her designs evoke nature with their seasonal relevance. Her lush blend of flowers and branches, fruits and vegetables as well as gorgeous silk textiles and ribbons combine for a final product which is both sensual and evocative. Ariella began her career in the Berkshires working with Pamela Hardcastle and Barbara Bockbrader. These brilliant floral and garden designers inspired Ariella to combine her love of art and the dramatic with her passion for the natural world. “Pamela and Barbara showed me that art and life can be intertwined.” Ariella spent a season selling wreaths to New York flower shops and to shoppers along the streets of SOHO and Greenwich Village. Then she worked with Robert Isabell before moving to the West Coast in 1998. In 2002, Chronicle Books published Flowers for the Table, a guide to choosing seasonal flowers and a lesson in designing with the bud’s natural form. The book revolves around several seasonal occasions, from a summer wedding in the country to hot colored poppies on a cold winter’s night. Beautiful photographs bring Ariella’s ideas to life. 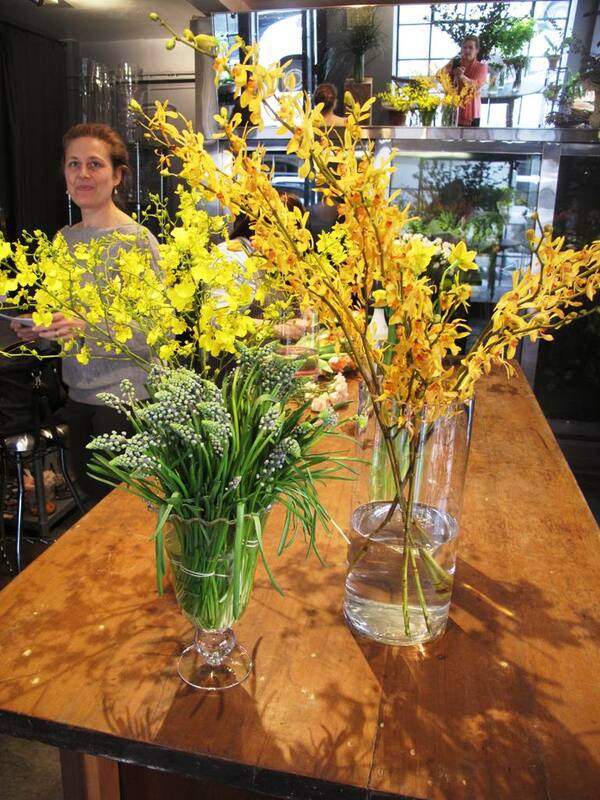 Her personal style and enthusiasm makes Flowers for the Table an inspiration for us all. As of December, 2003, Ariella moved back to the East Coast. It was a delight to visit with this inspirational and truly generous talent! My podcast interview with Ariella will update you on all her wonderful projects. I suspect you are as in love with Ariella Chezar – and her giving spirit – as I am. 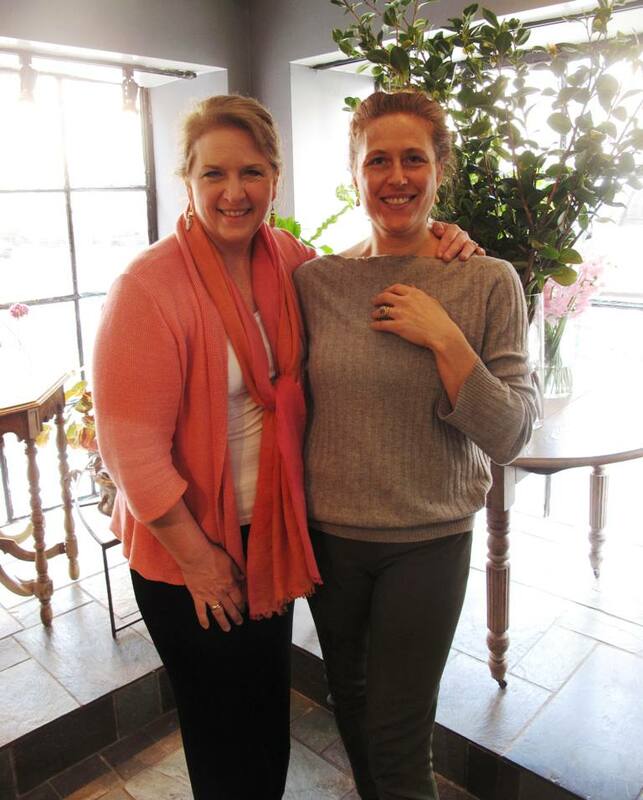 She has mentored and encouraged so many in our industry, not treating other designers as potential competition, but instead, viewing each as a kindred spirit, a fellow promoter of beauty and sustainability in floral design. You can follow links on my website to Ariella’s work on Facebook, Instagram and Pinterest – and sign up for her newsletters that will keep you posted on her workshops and her forthcoming new book. Because of the support from you and others, listeners have downloaded episodes of the Slow Flowers Podcast more than 8,000 times! I thank you for taking the time to join to my conversations with flower farmers, florists and other notable floral experts. This entry was posted on Wednesday, March 19th, 2014 at 7:04 am	and is filed under American Grown, Blog Posts, Creativity, Entertainment, floral design, General, Podcast Episodes, SLOW FLOWERS Podcast. You can follow any responses to this entry through the RSS 2.0 feed. You can leave a response, or trackback from your own site. Big Island artisan Cymbidium breeder & grower. I wish I lived closer to this gifted florist so my couples could benefit way down here in southern NJ. I do a lot of nature based weddings and an offbeat floral arrangement is often what they’re looking for.